We have a major M&A move in the metro fiber space, and no it does not involve Zayo. In a transaction announced today, Lightower and Fibertech will be merging in an all cash deal. The deal brings together two of the last remaining regional players in New England, creating a supra-regional fiber builder and operator with dense metro networks throughout the triangle between Boston, Washington DC, and Chicago, plus an ongoing expansion project into Virginia. The combined company will have some 30,000 route miles of fiber hooking up 13,000 on-net locations, including some 5,000 wireless towers. It's a very natural combination on an asset basis. For Lightower, the space between Chicago and the rest of its footprint has been a gap I've expected them to find a way to fill someday. 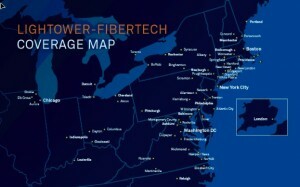 Fibertech's metro presence in upstate New York, Pittsburgh, the major cities of Ohio, Detroit, and Indianapolis go a long way toward doing that. Of course, Fibertech's markets along and around the I-95 corridor are quite complementary to the rest of Lightower's footprint, giving them even more depth. Lightower has been quite acquisitive over the past five years, acquiring Veroxity, Lexent Metro Connect, NSTAR's dark fiber, and Open Access before making its big move to buy regional rival Sidera Networks in 2013. Last month, they acquired Colocation Zone for some data center and interconnection space in Chicago. Fibertech was always a logical target for them, the main question was whether it would be a willing one. But in the end, it's the private equity guys on both sides that determined that I'm sure. It's an all-cash deal valued at $1.9B, just shy of the valuation given for the Sidera deal two years ago. Berkshire, Pamlico, and ABRY, Lightower's three private equity backers, will each be chipping in more equity to get the deal done. They'll be buying out Court Square Partners, which partnered with Fibertech's management to take ownership of the company a few years ago. No other financial details were provided, so if anybody has a multiple to share for the deal then please enlighten us. The combined company will be led by Lightower's CEO Rob Shanahan, although the rest of the management team will probably be hashed out over time. But if Shanahan is staying on, then that means that Fibertech CEO John Purcell likely will not be. I wonder what project he'll be taking on next. While he took the organic route at Fibertech, Purcell's move into metro fiber pre-dated that of Dan Caruso and the formation of Zayo. In many ways, he was the one that proved that the metro fiber business model was worth rolling up in the first place. I was wondering when this transaction was going to occur. I had always thought they would go to Zayo and the assets now combined with Lightower may still end up with Zayo but perhaps delayed a few years. It will be interesting to see how the team structure plays out over the next few weeks and months with respect to who is in what positions at the combined company but make no mistake about it clearly lightower is driving this so expect to see more lightower management than not. Good luck to all those Fibertech foiks. You’ve done well for yourself and I expect you will continue to do so. You think they will layoff in house fibertech splicers since lightower doesn’t have any? Lightower does not use in house splicers. they use contractors. I ASSume that for “non overlapping” areas, the splicers will be fine. note to Fibertech employees, don’t panic. The last few mergers/acquisitions majority of Sidera employees stayed on. Although that transaction was more of a so called “merger”, My inside opinion is that LT will try to integrate where possible. Lightower bought Veroxity, not Verocity. I know all of Fibertech’s upper management is staying on to run the Western Region out of the Rochester office… Their business practices are part of the reason they’ve been so successful with very little to no churn. I expect there to be some compromise but I don’t think a whole lot will change operationally… Lightower CEO hasn’t been shy in letting it be known they’ll be looking to swipe up some other regional players in the near-future to provide some more density in their markets… Although none with the footprint of Fibertech.This was a good move for both sides and will help them go head to head with the Zayos and Level 3’s. Now let’s see if they can work together to make this thing work.